Having experienced numerous Alejandro Escovedo shows dating back to a show at the 400 Bar in Minneapolis a couple decades ago, and countless other local venues including 7th Street Entry, Turf Club, Fine Line, MN Zoo and at least 4 times at the Dakota Jazz Bar as well as traveling to the High Noon Saloon in Madison I have witnessed many great shows. Why else would I keep going? I certainly am not rich and shows at the Dakota aren’t exactly moderately priced for the working class, but with Alejandro you always get what you paid for and some nights, like last Saturday’s show at the Dakota, you get more. Much more. 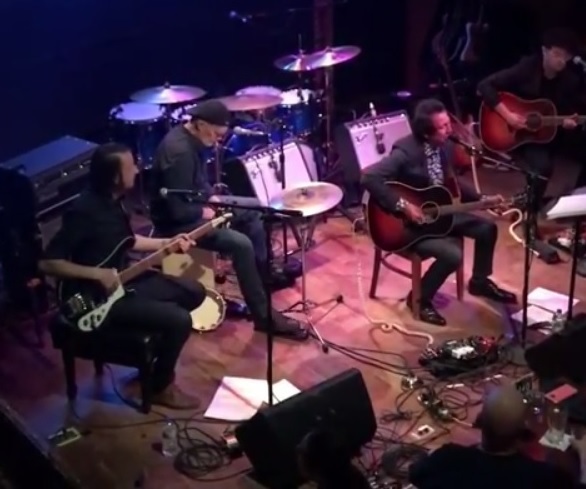 Fresh off the European leg of the “Burn Something Beautiful” tour where they played something like 35 shows in 42 days, the latest incarnation of the Alejandro Escovedo Band was in peak form. One of the reasons I find Escovedo so compelling is he always has the best musicians supporting him and with Austin Texas as your farm team league, to use a baseball analogy, it is not surprising. However, as fond as I am of Hector, Bobby, David and all of the other great players I have been privileged to witness over the years, there is something about last Saturday night’s performance that makes the current cast of, Scott Laningham: on drums, Nick Diaz: on guitar and Aaron McClellan: on bass, stand out. Not to take anything away from Scott and Aaron who were excellent, but Diaz’s guitar work blew me away with his tone, precision and economy of notes all with the ease and grace of say a Denny Freeman. Even more impressive about Diaz’s playing was it was always about the song and complimenting the songwriting and when you are performing with one of America’s greatest living songwriters, it’s all about the song and he gets it. Diaz and Alejandro worked beautifully together and at times they and the band hit that eargasmic sweet spot that is so rare but is the drug that musicians and audiences live for. The show opened to Escovedo and band taking the stage to no applause which caused the formerly, at times, caustic one, to make a sarcastic quip right before launching in to the most menacing and best version of “Can’t Make Me Run” these ears have heard. Back in November of last year (2016) I caught just the second live performance of a different incarnation of the Alejandro Escovedo band (only the bass player was a holdover). Although I thought the previous version of the band had done quite well playing such tough material on little rehearsal, it was apparent from the very first song that the current lineup were really a band, firing on all cylinders. The strong opening was followed by an equally strong “Dear Head on the Wall” which I used to assume (incorrectly) was about the Club Tavern outside Madison, WI. This would be the first of two songs off the Boxing Mirror cd which signaled Escovedo’s return from the illness that nearly killed him. The first selection off his latest work, the wonderful “Burn Something Beautiful” cd, was “Shave the Cat”, a crowd favorite. A fun rocker, Shave is destined to become a staple at wrestling practices and full-service hair salons well into the new millennia. The good vibe was kept going by the next number, one off his “Man Under the Influence” cd on Bloodshot records. The ever grateful and humble AE thanked the label for backing this project, a milestone in his career and which he credits with bringing in a new fan base. What followed was worth the price of admission alone and for all of you who took a flyer on this show (you know who you are, bro) you missed a rare live performance of one of his gems, “Rhapsody”. The best part was, for a song he never performs live, he nailed it and much of the kudos goes to the wonderful band. If you had not figured it out up to now there was no way you could miss the fact that you were witnessing something very special after the stunning performance of “Rhapsody”. Continuing with another off of “Man under the Influence” was the achingly plaintive “Don’t Need You”. About this time, as the band was switching over to do the acoustic portion of the show, the only miscue all night occurred and it wasn’t a big deal. Just a little feedback which took a couple seconds to correct, nevertheless Alejandro did not let the opportunity to try his hand at stand up go by, cracking “that was the Brian Eno portion of our set”. When you’re hot you’re hot and these cats were on fire. The acoustic set had the band seated toward the front of the stage including drummer Scott Laningham who traded his full drum kit in for a one-man band setup. No matter, whether bashing on his big kit or providing subtle nuances perfect for the acoustic numbers, Scott’s expressive drumming was vital to setting the range of moods and shades of music on Escovedo’s songs. The career retrospective mini set of Five Hearts Breaking, Wave, Suite of Light and Rosalee had the intimate feel of a living room and the relaxed staging paid off. This was when the band really jelled and played so perfectly together it was as if they were controlled by one mind. At times the music they were making sounded so beautiful, so exquisite you had to pinch yourself to come back down to earth. Plugging back in for the electric final segment of the night started off with the slow burn “Sally was a Cop” followed by a deep dive in his catalog to “Crooked Frame”. Next up was a spirited version of “Break This Time” which first appeared as Alejandro’s sole performing contribution on the tribute/benefit project “Por Vida” and later on “Boxing Mirror”. 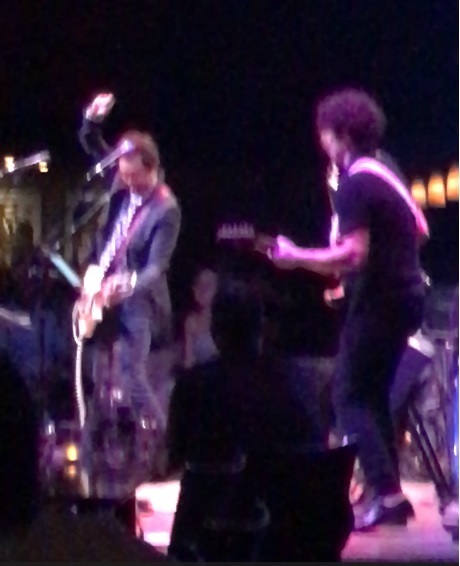 The series of songs culminated with a raucous version of “Castanets” that had Escovedo and Diaz exchanging blistering guitar leads with Escovedo hopping up and down and doing windmill guitar strokes ala Townsend circa Maximum R n B era. A night of surprises and memorable performances was not over yet as the audience brought Escovedo and company back for two more encores, a mesmerizing rendition of Leonard Cohen’s “Alexandra’s Leaving” followed by “Johnny Volume” a personal favorite, from “Burn Something Beautiful”. 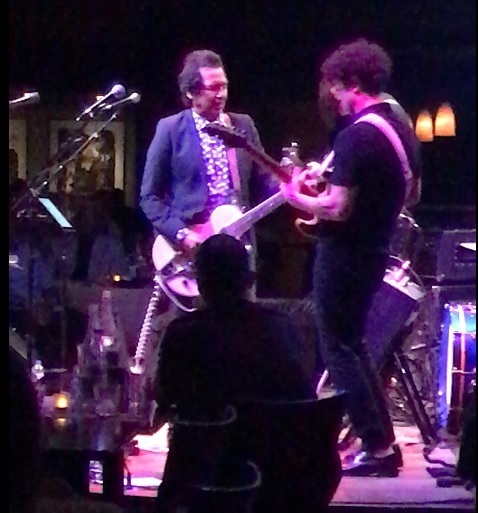 The Alejandro Escovedo Band’s performance at the Dakota Jazz Bar in Minneapolis last Saturday night was magical. A masterful example of pacing and set list selection covering almost all periods of an incredibly rich and diverse career. The band and Alejandro were in peak form thanks in part, no doubt, to a grueling schedule which allowed the band to get to know each other and the material, even if it was at the risk of exhaustion. Despite the ravages of the road, Alejandro was in fine form, strong voice and good spirits. One would be remiss not to acknowledge his hidden but perhaps most important asset and ambassador of good will, his gracious partner and wife Nancy Rankin Escovedo. Nancy has become a staple at his shows and her sweet kindness and sincerity in working the merchandise table is matched only by her talent as a photographer. Follow her on twitter and/or Instagram not only to keep up with the band, but you will also be rewarded with some of the most creative examples of the art of photography found on the web. The Alejandro Escovedo Band left the audience at the Dakota satiated from a thoroughly satisfying night of good food and great music.